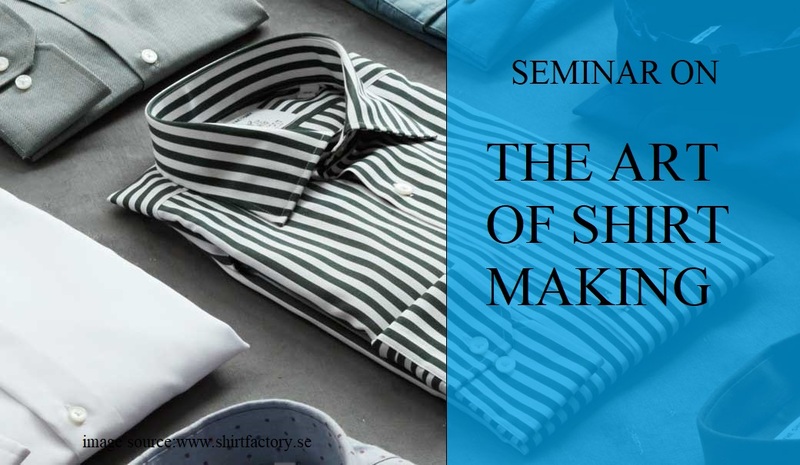 Today, I am sharing one press release about the seminar on “The Art of Shirt Making”, to be held at India International Center, Max Muller Marg, New Delhi on 15th September 2018. This seminar will be organized by TANTU Textile Alumni Association. Although Indian manufacturers produce some of the finest men’s shirts for domestic market, the export statistics is far from impressive. Most people talk about Bangladesh’s late surge of exports turnover overtaking India, but in respect to Men’s shirt making, Bangladesh was always ahead of India. Way back in year 2000 Bangladesh exported double the volume of men’s shirt to EU than India. Why India has poor record in shirt manufacturing? The answer is complicated…The panel discussion on Business of Shirt Making will try to find answer for same. Is it actually so standard? How much do we really know about Men’s dress shirt making? What are the critical and control parameters in cutting? Band knife or die cut-which one to be preferred for small parts cutting? Which fusing machine should ideally be used for collar fusing? Why collar and cuff may not need same fusible interlining? How the collar & cuff runstitch should be done to get a neater appearance at back side? Is lap seam by Feed of the arm technically correct seam for side seam join? Should a shirt be ironed or finished? These never ending queries kept the shirt-makers around the world guessing for the right formula. The panel discussions on Technology of Shirt Making should be able to deliberate on many of these queries. Dr. Prabir Jana, President, TANTU and Seminar Chairman says, "The panel discussions will be a rare treat to enjoy with video clippings and curated discussions. The experts from some of the finest Shirtmakers from India, Bangladesh, Srilanka and Indonesia will be on panel”. The seminar has already garnered attention from manufacturers and technology solutions providers from India and Bangladesh alike. The experts from Hugo Boss, Switzerland; Laguna Clothing, India; Elite garments, Bangladesh; Raymonds, India; Madura Garments, India have already confirmed to participate in the innovative audio visual panel discussion. Industry veteran Mr. Partho Kar, Chief Consultant at Biswa Bangla Retail, Government of West Bengal has kindly agreed to be the Chief Guest for the seminar. Freudenberg, Germany; Martin Group, Italy; and Tukatech, USA are associated with the seminar and will present the cutting edge solutions to get efficient with technology. While Freudenberg will present their innovative and latest solutions to shirt interlining, Matin Group powered by SAKHO will compliment with why right fusing machine technology is important for getting a good fused component. Tukatech will present their 3D solutions for shirt making. Time SSD from Romania is associated as Silver Partner and will present how to empower the shirt manufacturers through PMTS to improve their productivity in cost effective way. TANTU Textile Alumni Association is the North India chapter of two iconic textile colleges of West Bengal. As a group of core professionals serving textile and allied industries, TANTU brings together experts and working professionals on a common platform to discuss, debate and deliberate on issues related to textile industry so that the industry accrue optimum benefit from the services of professionals and sustain in the competitive market. Learn more about the seminar and seminar organizers.